Another new shade from stargazer and another colour I love. 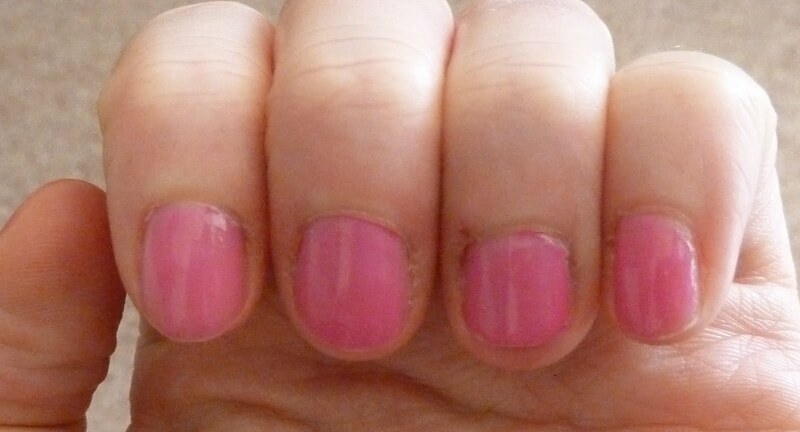 But it is hard to capture on camera – it’s basically a true barbie pink, the consistency is quite sheer – I like this, but if you want it opaque you will need 3+ coats, I went for two and was happy with the slight translucent effect. Again, these polishes do smell pretty bad (I’m 99.9% sure they are NOT big 3 free… correct me if I’m wrong) but they dry super fast and are very glossy. I painted my nails on a train on Saturday morning and about 5 mins after finishing the ticket inspector guy came round – my nails were already totally dry and didn’t smudge a bit. Also, in my last stargazer post I mentioned about the state of the stargazer displays in New Look stores – have to admit, I went to the New Look store in Cambridge on Saturday and it had a good selection and wasn’t a total mess. There were quite a few swatches painted all over the place, but still – was easily the neatest and best stocked counter I have seen to date. I’ve still got to try this brand! What a pretty color. Very pale and delicate! Love it. For me though, I’d rather go a little wild with turquoise nails. After all, I’ve heard in so many places that it is one of the big colors of the summer. That and coral anyway. Thanks for sharing this and cute blog too!